Share the post "Mother Nature’s Sketchpad"
Well, I guess we’ve been caught at the tail end of what’ve I always believed to be our most bitter times of extended cold. If you remember, I mentioned earlier how over the years, the worst of the cold always seemed to arrive during the last two weeks of December and the first two weeks of January. This winter’s bitter cold arrived yesterday which would in a normal sense, be very late since the 14th of this month would be the breaking point of the extended cold time. I looked at the weather and it appears we’ll only have these frigid days for most of the rest of this week and then it’ll slowly start warming up again. I’ve been eternally thankful I didn’t catch something several days while out too long because of not having been dressed warm enough to keep me from getting chilled. That night and the following day, I thought I was teetering on something taking hold but I guess I was lucky enough to have shaken it. For me it’s always the very cold air getting into my lungs that weakens my resistance. Knowing that, I’m all the more careful to keep my mouth covered as much as possible while outside. Hot green tea and honey always seems to give a healthful boost when on the verge of catching something. A couple scheduled an appointment to see a home today at noon and luckily I arrived a few minutes early. When I pulled up I noticed the snow hadn’t been fully shoveled so I had to stumble about trying to get up to the front door. Fortunately I made enough tracks for the buyers to get themselves maneuvered safely into the home when they arrived. It seems the lower the temperatures drop, the more fearful I become of furnaces going out in vacant homes and subsequent frozen water pipes. I’ve mentioned numerous times to homeowners, “Please make sure your water is shut off in the basement if you’re going to be gone for any extended period of time.” It’s not just a precaution should the pipes freeze, it also guards against pipes suddenly leaking water or even an old water heater deciding to blow. The hoses for refrigerator ice makers are the worst culprits. I’ve heard many nasty stories over the years about how much damage leaking ice maker hoses create once they’ve sprung a leak. Whatever happened to people using ice cube trays to create their ice? We’re spoiling ourselves far too much to the point of possibly creating more un-necessary structural damage to our homes. 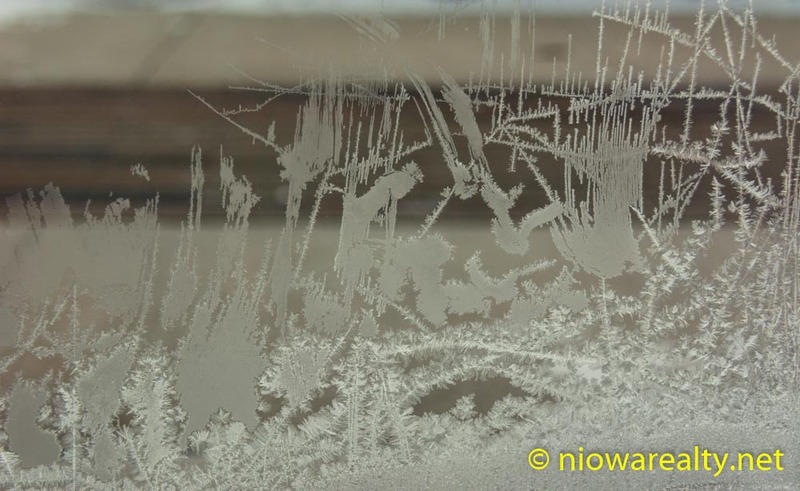 What most of young people don’t remember are the single pane windows frosting over during these bitterly cold days and the beauty created by Nature’s original designs. With the advent of thermal windows, there are fewer and fewer places to find the handiwork of Jack Frost. Of course I also remember a time or two in my youth when other youngsters licked a piece of metal and got their tongues stuck—not a pleasant sight or sound. One young man really got his tongue stuck to a flagpole at school and squealed like a pig in excruciating pain with his tongue having been fully stuck to the pole. I don’t want to remember how difficult it was to get himself free. Someone said to me the other day, “We’ve all tried a lick or two when young in time or other.” I replied, “Fortunately for me, my hatred of the cold kept me from even thinking about doing such idiotic things.” On sunny and calm days, winter does have its times of great beauty. I took the above photo today, and after looking at it more closely, it looks like an ostrich getting ready to peck at something. It’s yet another good example of a rough draft from Mother Nature’s Sketchpad.